NASSAU, The Bahamas – Minister of National Security the Hon. Marvin Dames said that since assuming office in May of last year, the government was acutely aware of the “daunting challenges” it faced in tackling crime and while the Government commended The Bahamas' “brave” law enforcement officers for the positive inroads made to date, there remained much work left to do in 2018 that will require the collective effort of every resident. 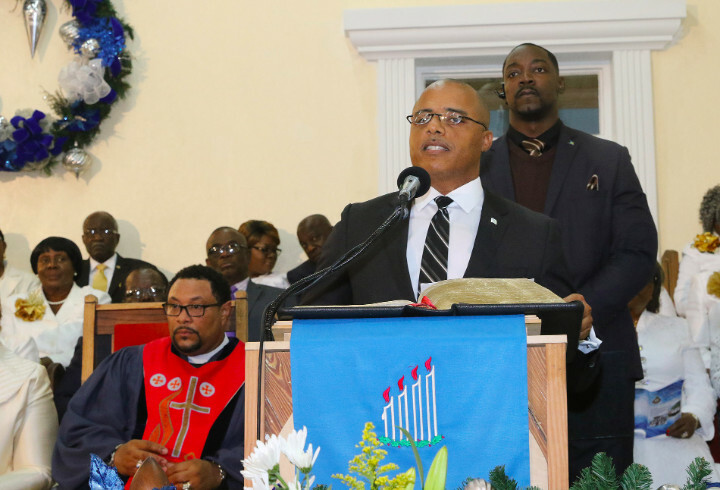 “When we came to Office a top priority of ours was to find a short-term solution for the high incidence of violent crime, especially murders,” Minister Dames said, January 7, 2018 at the Annual Royal Bahamas Police Force Church Service, held at Zion Baptist Church, Shirley Street. “Led by a new commissioner, Mr. Anthony Ferguson, Guns and Gangs and a Rapid Response Units were formed to identify, target, arrest and dismantle these crime networks; hot-spot crime areas and prolific offenders were targeted under a more deliberate and sustained approach, culminating in the development of a force-wide patrolling strategy,” he said. “The strategy was focused, intentional, dynamic, relentless and it allowed for patrol officers to be within striking distance of incidents as they occurred. “In the coming months our Government will be introducing additional policies that we have spent a considerable amount of time on that are holistic in scope and are expected to complement current law enforcement efforts and restore the peace in our communities,” Minister Dames said. Minister Dames pointed out that, for the past several months, a comprehensive Police Manpower Audit was undertaken and would be completed in a few weeks. What that audit, he said, the Government would determine what was the necessary number of officers needed within the organization to effectively provide policing services to communities on a sustained basis. Moreover, he noted, the Police Manpower Audit would end the need for prescribed promotion dates determined by politicians. Minister Dames said that the Audit would also detail how the command structure should be arranged in order to operate an efficient 21st-century police organization. A similar audit is currently underway in the Royal Bahamas Defence Force; and the Bahamas Department of Correctional Services will also undergo an audit – which is scheduled to commence during the second quarter of 2018, he said. Minister Dames said that the Government understood that in the dynamic and constantly changing field of law enforcement, training and education are essential. The Government also know that the police force was filled with a number of talented officers who have the capacity to, one day, lead the organization. “Towards this end, our government has committed to establishing a Succession Plan that will involve international attachments, training and postings to critical areas of the Force,” Minister Dames said. The Government is also serious about improving infrastructure and providing officers with equipment necessary to perform all their duties optimally and professionally, he said. Minister Dames said, as Minister of National Security, he was also acutely aware of the substandard working conditions that many officers have had to contend with for far too long. “We cannot expect you to give of your best when we fail to acknowledge and fix the substandard environment in which you work,” he said. Minister Dames said that, in a world of technological advances, the Government was fully committed to modernizing the Royal Bahamas Police Force to ensure that it keeps pace and remain on the cutting edge of law enforcement. “Last year we rolled out the test phase of body cameras,” Minster Dames said. “We are working with global industry leaders in such areas as improved CCTV technology, analytics, facial recognition capability, license plate recognition, artificial intelligence, gunshot detection, cyber, drones and radar technology to name a few. Bahamians can expect to see many of these tools introduced this year. Minister Dames said he recently reconvened meetings with all Heads of Law Enforcement Agencies (inclusive of Corrections, Customs, Defence, Immigration, and Police) and they had been mandated by the Government to establish a Multi-Agency Task Force to protect Bahamian borders. Minister Dames said that the Government fully understands that crime fighting rest not in the hands of the police alone. On behalf of Prime Minister the Hon. Dr. Hubert Alexander Minnis, The Government and People of The Commonwealth Of The Bahamas, Minister Dames publicly thanked “the fine men and women of the entire law enforcement community” for the work that you continue to do. Minister Dames said how very pleased he was to be in the Annual Police Church Service at historic “Mother Zion”. He said he also remembered and joined them in paying respects to serving officers who fell from the ranks of law enforcement over the past year, adding that may their souls rest in peace.